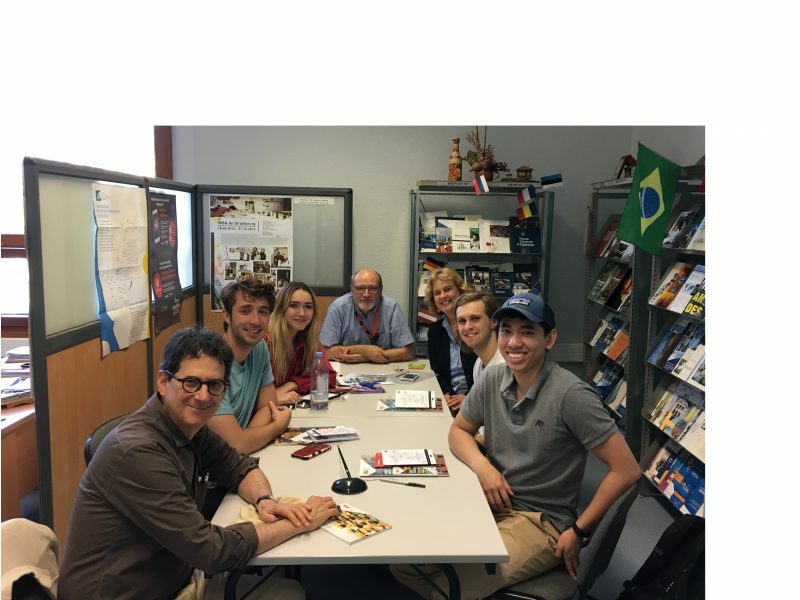 INSA Strasbourg welcomes for the third time a group of engineering students from Syracuse University in the State of New York for a six-week internship research project. From mid-May, 4 new students from different engineering fields participate in the study abroad program thanks to a partnership with the Syracuse University Study Abroad Center in Strasbourg. They will do their internship in two different fields: mechanical engineering and chemical engineering. Elizabeth Sayles will participate in a study on the mechanical resistance of tole assemblies in collaboration with Dr. Mathieu Solar. Joseph Guida and Eric Thoi, tutored by Dr. Renaud Kiefer and Thomas Pavot, will work on the same project on mechanical CAD design of a drone (UAV). Christopher Kazem will work on the chemical engineering project called “De-scaling process by electrolysis of water”, which could be applied on HVAC systems. He will work in collaboration with Dr. Philippe Denier. The day of their arrival they were warmly welcomed by the international relations team of INSA Strasbourg and they were shown the places where they will work for until the end of June. We wish Elizabeth, Joseph, Eric and Christopher a pleasant and enriching stay at INSA Strasbourg. Around the table, from left to right: Raymond Bach, director – SU Strasbourg center, Joseph Guida, Elisabeth Bach, Phillipe Denier, Professor, Electrical & Energy Conversion Engineering INSA Strasbourg and responsible for cooperation between SU and INSA, Angelika Hamman, head of the International Office – INSA Strasbourg, Christopher Kazem and Eric Thoi. Partager la publication "Welcome to Elizabeth Sayles, Joseph Guida, Christopher Kazem and Eric Thoi -Syracuse University"